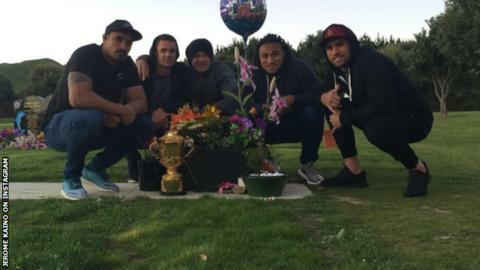 New Zealand's World Cup winners have visited the grave of ex-team-mate Jerry Collins with the Webb Ellis trophy. Former Ospreys back-row Collins and partner Alana Madill died in a crash in France in June. Collins, capped 48 times by the All Blacks, would have turned 35 on Wednesday. Jerome Kaino, Dan Carter, Sonny Bill Williams, Ma'a Nonu and Liam Messam visited his grave after returning to New Zealand having won the World Cup. Although Collins and Madill died in the crash, his baby daughter, Alya, survived and now lives with her mother's family in Canada. Fly-half Carter wrote on Instagram: "Good to share this one with the brother. Love you JC."